The holidays are a great time of year to spend time with friends and family. If your Thanksgiving travels bring you into Columbia & Montour Counties this week, there are plenty of great events and area activities planned this week that will provide fun for the whole family. Berwick’s 109th Annual “Run for the Diamonds” Race – Before the turkey dinner finds its way to the table, head over to Berwick to be a part of an incredible Thanksgiving Day Tradition – the 109th Annual Run for the Diamonds. Spectators will come out early to line the course and runners from around the world will gather at the start line for a 10:30 start. The 9-mile course, unchanged from the inaugural route, takes runners throughout the Berwick borough. It starts and ends at Market Street. The race used to be called the “Berwick Marathon” until the 1970’s and 1980’s. However, since the race is too short to qualify as an official marathon, and winners receive diamonds as part of their prize, the name was changed to “Run for the Diamonds” and has stuck ever since. For more information, visit the Event Facebook Page or the Run for the Diamonds website. 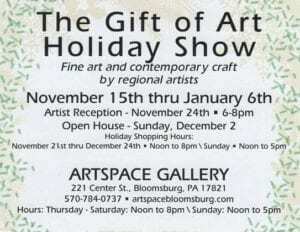 Artspace Gallery Holiday Show – Visit Artspace Gallery in downtown Bloomsburg for a special holiday artist exhibit. The entire staff of artists from Artspace are participating in this final show for 2018. The original, one-of-a-kind pieces that are made by local artists in the exhibit will make for great holiday gifts! A reception will be held on Saturday, November 24 from 6:00 PM to 8:00 PM (simultaneous with Exchange Gallery “Cash & Carry” reception). For gallery hours, and more information, please visit the Artspace Gallery’s website. WHLM Parade of Lights – If you’re already ready to be done with Thanksgiving and gear up for Christmas, look no further than the 2018 Parade of Lights in downtown Bloomsburg. Starting at 6:00 PM on Friday evening, the town will be filled with classic cars, floats, boats, fire trucks, entertainment, and of course – thousands upon thousands of Christmas lights! The parade ushers in the Christmas season, and Santa Claus will make a special appearance. Sizable cash prizes will be issued for the best floats, so the competition will be stiff and the floats will be well crafted! The parade will leave from the Geisinger Bloomsburg Hospital parking lot and travel down Lightstreet Road onto Main Street. The parade then turns at Market Street and eventually will end at the Bloomsburg Fairgrounds (5th Street entrance). Visitors attending the Parade of Lights are also invited to join the festivities at the Caldwell Consistory for TreeFest, or at the Bloomsburg Fairgrounds for Winterfest. The Parade of Lights is hosted by WHLM Radio Station and sponsored by the Bloomsburg Area Rotary Club. For more information, visit the Parade of Lights website. Bloomsburg Fair Winterfest – The first annual Winterfest will be held at the Bloomsburg Fairgrounds on Friday, November 23rd from 10:00 AM – 9:00 PM and Saturday, November 24th from 10:00 AM – 5:00 PM. There will be ice sculpting, wood carving, craft vendors, food vendors, wineries, live reindeer, face painting, toy train and race car displays, horse and cart rides, pony rides, and games. Tickets to 2019 Fair Grandstand Shows will also be available during Winterfest. Parking and Admission to the Fairgrounds for the event will be FREE. Enter at the Main Street entrance of the Fairgrounds. For more information, please visit the Event Facebook Page. SPECIAL TO FRIDAY EVENING: On Friday evening, the Parade of Lights will arrive, led by Santa Claus and beautifully crafted floats. Coming Home for Christmas – Don’t miss the 1st Annual “Coming Home for Christmas” Festival in downtown Bloomsburg from 10:00 AM – 5:00 PM. Shop vendors for holiday gifts, partake in holiday events and activities and later, stay for the Town Tree Lighting Ceremony. FREE town parking will be offered due to holiday meters. Vendors for the Holiday Market will be surrounding the Bloomsburg town fountain and will extend up North Market Street to 1st Street. For full details about the event, visit the Event Facebook Page. TreeFest in Bloomsburg – TreeFest kicks off on Friday evening at 4:00 PM and continues all weekend at the Caldwell Consistory in Bloomsburg. The event began in 1989, and serves as a fundraiser for the Bloomsburg Theatre Ensemble (BTE). TreeFest begins with local Christmas tree growers who donate over a hundred live trees to be trimmed. 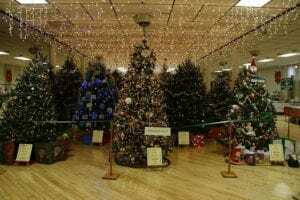 Then, community volunteers, youth groups, florists, garden clubs, and other local organizations set up and decorate the rooms and the trees for the holidays. Each tree will be sponsored by an area business or individual. Throughout the event, local entertainment is provided, including school choirs, dance groups, and folk musicians. Adding to the holiday atmosphere, visitors will be able to start their Christmas shopping with the dozens of professional craft artisans displaying their wares for sale. A special silent auction will also be held during the event. At the conclusion of the year’s festivities, the trees are donated to area families in need. Adult admission is $6, and children 12 and under are FREE. Official parking for the event is available on weekends, and is located behind the Columbia County Courthouse. For more information, visit the Event Facebook Page or the TreeFest website. Cash & Carry V Preview Day at The Exchange Gallery – Join the Exchange Gallery for a preview day of their newest exhibition – “Cash & Carry V”. Sales for the fifth annual show don’t start until 6:00 PM on Saturday, but you can come in at any time before then and have a look at all of the great artwork by your friends and neighbors – more than 300 pieces were submitted by everyone; from Bloomsburg University art professors to area schoolchildren. The Gallery will stay open late on Black Friday so visitors can make the Exchange Gallery a stop on their trip downtown. Before visiting the Gallery for the reception, be sure to also visit Winterfest, TreeFest, or catch the WHLM Parade of Lights! 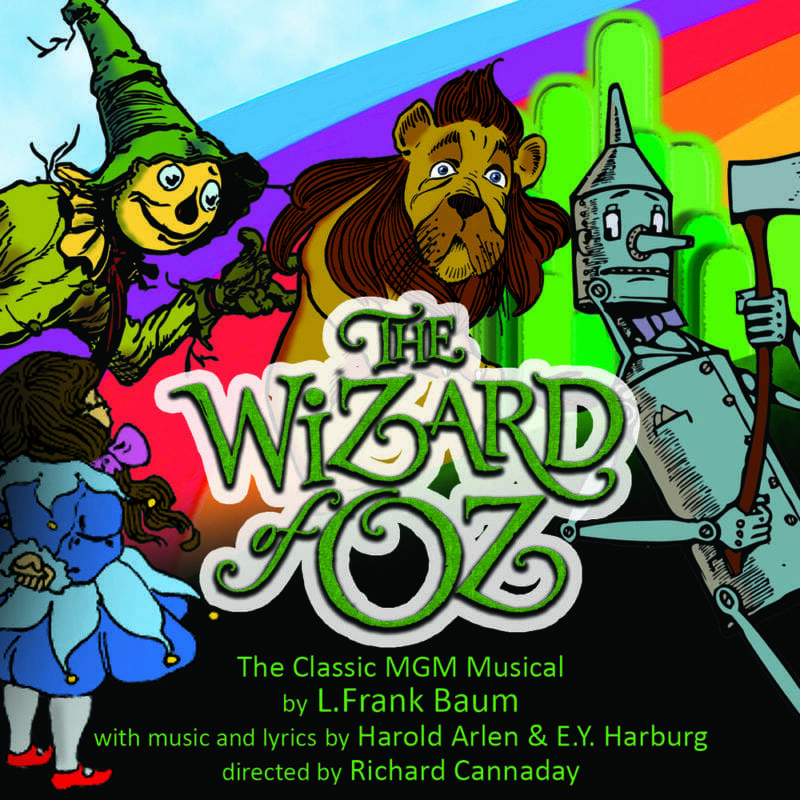 Afterward, head down the street to the Artspace Gallery’s Holiday Member Show or to the Bloomsburg Theatre Ensemble for the “Wizard of Oz” performance at 7:30 PM. For more information, visit the Exchange Gallery’s website. The Wizard of Oz at BTE – Click your heels together three times and join the Bloomsburg Theatre Ensemble for a whimsical journey as they bring the beloved musical to the local Bloomsburg stage! When a tornado rips through Kansas, Dorothy and her dog, Toto, are whisked away to the magical land of Oz. With help from a Scarecrow, a Tin Man, and a Cowardly Lion, they dodge witches and talking apple trees in search of the powerful Wizard. Whether you’re new to the yellow brick road or a long-time traveler, join in the fun that will leave you saying “There’s no place like BTE, There’s no place like BTE.” Before the show, visit the downtown art galleries, TreeFest, or Winterfest! For more information about showtimes, or to purchase tickets, visit the Bloomsburg Theatre Ensemble’s website. Small Business Saturday in Danville – Start your holiday shopping in downtown Danville on Saturday! Join the Danville Business Alliance and shoppers everywhere to support and celebrate your favorite small businesses on Small Business Saturday. You’re shopping small every time you pick up a cup or a bag of coffee at your local coffee shop, grab lunch or dinner at a local restaurant, buy something new at a local boutique, or catch a show at the Booth Theater. Various businesses will be offering special deals and discounts in celebration of the day. Help support the small businesses that help make your community vibrant and unique! For more information, visit the Danville Business Alliance website. TreeFest in Bloomsburg – TreeFest continues on Saturday from 10:00 AM – 6:00 PM at the Caldwell Consistory in Bloomsburg. The event began in 1989, and serves as a fundraiser for the Bloomsburg Theatre Ensemble (BTE). TreeFest begins with local Christmas tree growers who donate over a hundred live trees to be trimmed. Then, community volunteers, youth groups, florists, garden clubs, and other local organizations set up and decorate the rooms and the trees for the holidays. Each tree will be sponsored by an area business or individual. Throughout the event, local entertainment is provided, including school choirs, dance groups, and folk musicians. Adding to the holiday atmosphere, visitors will be able to start their Christmas shopping with the dozens of professional craft artisans displaying their wares for sale. A special silent auction will also be held during the event. At the conclusion of the year’s festivities, the trees are donated to area families in need. Adult admission is $6, and children 12 and under are FREE. Official parking for the event is available on weekends, and is located behind the Columbia County Courthouse. For more information, visit the Event Facebook Page or the TreeFest website. SPECIAL TO SATURDAY: Photos with Santa Claus! Cash & Carry V Exhibit/Reception at The Exchange Gallery – Join The Exchange Gallery for a special show reception on Saturday from 6:00 PM – 8:00 PM to celebrate the Cash & Carry V exhibition. There will be a fantastic variety of over 300 pieces of handmade local art on display. Everything is on sale for between $10 and $50, depending on the size – and they make perfect holiday gifts! All artists receive 80% of every sale, with the rest going to the Gallery to help keep the lights on and bring the arts to communities throughout the region all year. Before visiting the Gallery for the reception, visit Winterfest, TreeFest, or do some shopping in downtown Danville! After you visit the reception, head down the street to the Artspace Gallery’s Holiday Member Show reception (happening simultaneously) or to the Bloomsburg Theatre Ensemble for the “Wizard of Oz” performance at 7:30 PM. For more information, visit the Exchange Gallery’s website. Artspace Gallery Holiday Show & Reception – Visit Artspace Gallery in downtown Bloomsburg for a special holiday artist exhibit. The entire staff of artists from Artspace are participating in this final show for 2018. The original, one-of-a-kind pieces that are made by local artists in the exhibit will make for great holiday gifts! A reception will be held from 6:00 PM to 8:00 PM (simultaneous with Exchange Gallery “Cash & Carry” reception). For gallery hours, and more information, please visit the Artspace Gallery’s website. TreeFest in Bloomsburg – TreeFest continues on Sunday from 12:00 PM – 4:00 PM at the Caldwell Consistory in Bloomsburg. The event began in 1989, and serves as a fundraiser for the Bloomsburg Theatre Ensemble (BTE). TreeFest begins with local Christmas tree growers who donate over a hundred live trees to be trimmed. Then, community volunteers, youth groups, florists, garden clubs, and other local organizations set up and decorate the rooms and the trees for the holidays. Each tree will be sponsored by an area business or individual. Throughout the event, local entertainment is provided, including school choirs, dance groups, and folk musicians. Adding to the holiday atmosphere, visitors will be able to start their Christmas shopping with the dozens of professional craft artisans displaying their wares for sale. A special silent auction will also be held during the event. At the conclusion of the year’s festivities, the trees are donated to area families in need. Adult admission is $6, and children 12 and under are FREE. Official parking for the event is available on weekends, and is located behind the Columbia County Courthouse. For more information, visit the Event Facebook Page or the TreeFest website. 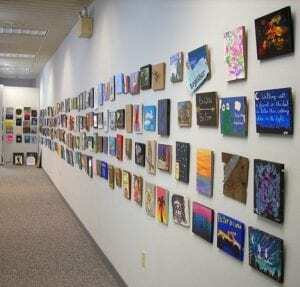 Artspace Gallery Holiday Show – Visit Artspace Gallery in downtown Bloomsburg for a special holiday artist exhibit. The entire staff of artists from Artspace are participating in this final show for 2018. The original, one-of-a-kind pieces that are made by local artists in the exhibit will make for great holiday gifts! For gallery hours, and more information, please visit the Artspace Gallery’s website.